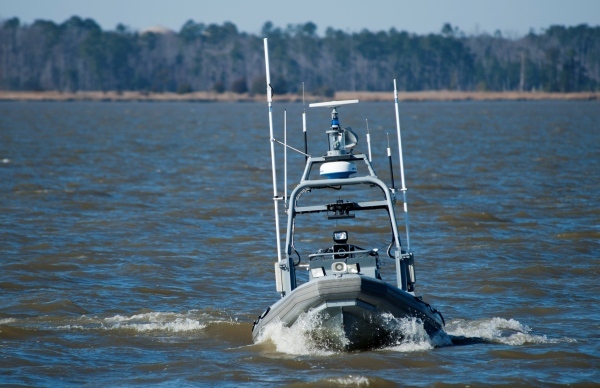 NORFOLK --- U.S. Fleet Forces Command (USFF) directed a follow-on fleet experiment this week off the shoreline of Fort Eustis to explore capabilities for unmanned surface vessels (USVs) to deploy non-lethal weapons during maritime security and force protection operations. "Equipping unmanned surface vessels with non-lethal weapons will further expand the capabilities of our Naval forces to confront an increasingly complex set of threats," Rear Adm. Scott Craig, USFF Deputy Chief of Staff for Fleet Policy, Capabilities Requirements, Concepts, and Experimentation said. "Results from this experiment will be relevant not only to the U.S. Navy, but also to other Services, coalition partners and allies." Operating in autonomous and semi-autonomous modes, the small militarized boats are equipped to employ a directional acoustic hailer, eye dazzling laser and flash-bang munitions; each non-lethal weapon was carefully-orchestrated to respond to a set of threatening behaviors from intruder vessels. During Trident Warrior 2011, held in July, the USVs' ability to autonomously react to vessels traveling in protected waterways were previously tested and validated. Cmdr. Mike Frantz, USFF's Director for Fleet Experimentation, explained the importance of experimenting with real assets in an operational environment. "The Fleet Experimentation program allows the Navy to partner with commercial and government organizations to address and obtain solutions where critical maritime capability gaps exist," said Frantz. "We each have a different piece of the solution and while laboratory experiments form the foundation of the technology development, the ability to experiment with that technology, at sea, in realistic scenarios, is crucial if you want the end result to be relevant to the Fleet Commander's need." More than 100 successful runs were completed over the course of the week. Experiment control collected geo-positional data from the boats, surveys from fleet users and observer logs from subject matter experts. The results are expected to drive recommendations to Navy decision makers. "No one is firing at us here in Virginia, nor are they trying to detonate any explosives near our ships, but these types of malicious scenarios drive our requirement to be prepared for the next time they do," Frantz said. "Getting this defensive capability into the hands of warfighters to counter that aggression will be a game-changer for our forces when they are operating in dangerous waterways." Participants for this event include USFF, the Navy acquisition community, several components of Naval Sea Systems Command, commercial industries and academia. The Fleet Experimentation plan continues in June with the start of the annual Trident Warrior experimentation series. This year's Trident Warrior is multi-phased and will be integrated with several large joint and multinational exercises in the West Coast operating areas.